barrier, or distance, for him. It’s inspiring to read these accounts because they remind me that I have to work on my own poetry manuscript and get it out into the fickle public. So many of us adult Viet adoptees who write, paint, perform, design, etc. still have so much to contribute to our culture and the general discussion as to what it means to be born over there and to grow up here. Our post-film discussion will include a panel of Adult Adoptees from the African Diaspora and include members of the audience who are Korean and Chinese transracial adoptees. This conversation will not explore the debate over transracial adoption, but push past whether or not its ‘right’ or ‘wrong’, but will argue for an understanding of adoption’s role in the politics of a global racism and examine the need to reform the social welfare system and the welfare systems connection to the prison systems. This event is also the first fundraiser for AFAAD. We really need your support for a basic start up budget. We need a P.O box, we need a web site, we need a database and a mailing budget to get the word out about the organization! If you can donate any of these or any other services to us – please contact us. Every dollar counts! Your donation is tax-deductible. For more information on our needs – please visit our website below. There were no bars or locked doors, no coils of razor wire or chains binding my body to a cold cement floor. The usual imagery associated with the word “captive” didn’t apply, yet the feeling of being trapped was almost tangible. It was something I could never accurately verbalize, though I’m sure my behavior at times left clues. Even now, I’m having great difficulty putting my thoughts into words. I wish I’d been better able to express my feelings as a child, but I wonder if it would have done much good. Would it have helped my parents to understand or only made me look like an ungrateful brat? The inability to communicate what I felt only compounded the problem. Not only did I feel trapped, but unable to call out for help. My sense of helplessness, alienation, isolation and their consequences all linked together as an invisible chain wrapped around my neck. It’s an old but reliable metaphor and how I’ve come to visualize that aspect of my adoption. Maybe I’m only being lazy, but it saves energy better spent elsewhere as I struggle for cohesion or some way to reconstruct a bigger picture. While none of the tangible objects normally associated with captivity were present, I was no less held prisoner in that I was in a situation not of my choosing and helpless to do anything about it. My fences were constructed by the knowledge that there was no where else to go. Ignorance of the world outside my tiny sphere of existence created the illusion that what I had was all there was. Sure I caught glimpses, but what I saw was so completely alien, it filled me with as much fear and apprehension as curiosity. In essence, I had no choices, because I wasn’t aware that any viable ones existed. As a result, I was left completely dependent upon my “caretakers” and reliant upon them not only for my physical needs, but everything else as well. Some might argue that this is the way life is for every child and to some extent, I agree. However, unlike my non-adoptee peers, the boundaries set by my parents, the environment in which I lived and my circumstances prevented me from pursuing my heritage, personal history and even others of my own ethnicity. I’m not saying this was done in a vindictive way, but mostly because of ignorance. 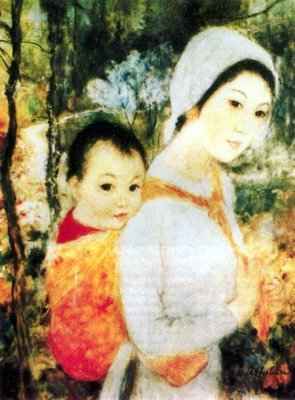 Adoptive parents in my time didn’t have the benefit of all the resources that are available today. Part of what infuriates me is that even with all the information out there, what happened to my generation is still happening. The excuses have simply changed or old ones recycled. I’m sure some will think I’m crazy for even bringing the word “captive” into the picture, but take away all the sugar and what do you have? When a child is deprived of their heritage, culture, personal history and prevented from their pursuit, they are being held in a kind of identity prison. I include non-TRA’s in this as well. They are deprived of their genetic and personal histories which is a part of one’s ethnicity. Personally speaking, I’m tired of all the sneaking around. I’m 37 years old yet still live a dual existence between my TRA self and the one my parents perceive. Now I have a choice, but feel it’s ludicrous that a choice needs to be made at all. In a very real way, I still feel as if I’m being held prisoner because of the reluctance of my father to disclose my history. The “choice” I’m being forced to make is between pursuit of what’s rightfully mine and his wish to keep it hidden. Interwoven is the dilemma of possibly causing conflict between my adoptive family and myself. The silly thing about that is the minute I felt forced to chose, the rift was already set into place. 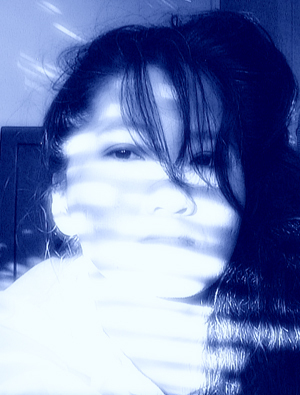 My situation is perhaps unusual, but I think the resulting conflict is more common than people would like to believe. Even if those things are made available, a child who perceives reluctance, discomfort and fear in their adoptive parents may be discouraged from actively pursuing their ethnicity and personal history. Though my parents never openly expressed discomfort, it was just something I sensed and was enough to enforce my silence. It’s sad to know that even adult adoptees who seem to have supportive adoptive parents still express feelings of being torn when it comes to pursuing their birth parents and/or ethnicity. Imagine what happens in the minds of children. I don’t know what the solution is nor do I like to think that such a dilemma is inevitable. Perhaps the key for adoptive parents is knowing when to actively participate and be encouraging and knowing when to step back and let go. The search for an adoptee’s past need never be a threat to the relationship between adoptive parents and their children. In truth, the perception of a threat can often times create the very chasm that one is trying to prevent. As for us adult adoptees, perhaps the trick is remembering that “freeing” ourselves is about us and not our adoptive parents. The burden of comfort and reassurance just isn’t ours to carry and can become the very chains preventing us from finding our truths. Seems it’s that time of year again, folks. 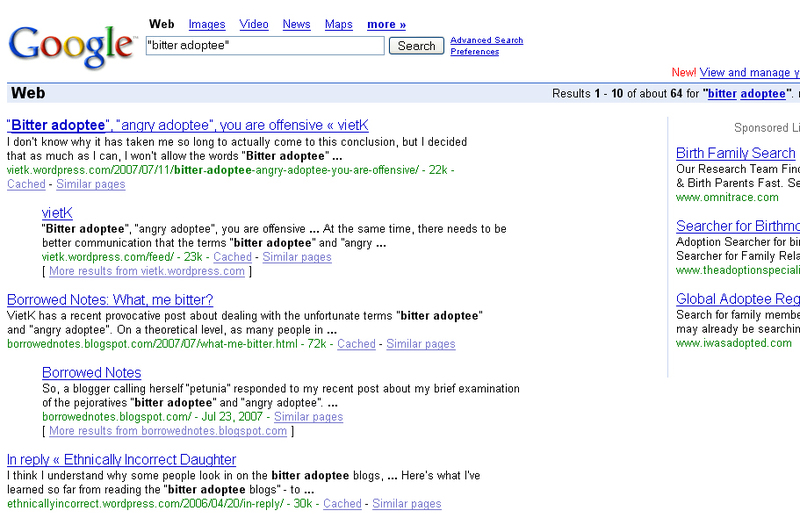 iBastard, Vietk and Kevin have put up their thoughts on “the bitter adoptee” with dead-on comments about how dehumanizing, invalidating and misleading it is to be referred to in such a condescending way. I don’t have anything new to add, but do feel the need for a little bouncy rant. As far as the labels go, I think I’m pretty much with Vietk on its use, but even there, it totally depends on context. 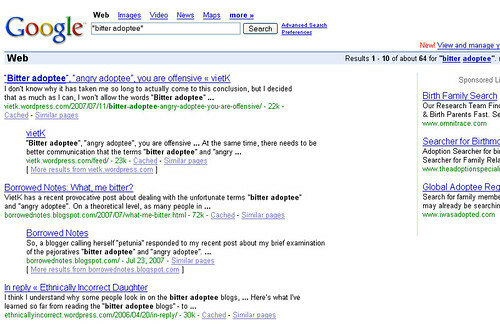 I can’t accept when other adoptees use phrases like “bitter adoptee” or “angry adoptee” in the same derogatory way as those who aren’t adoptees often do. Sometimes, they even use it to invalidate and dismiss the feelings of other adoptees. iBastard’s post provides an interesting example of how labeling can be used to tip the scales, polarize a subject and all but put a stop to balanced dialogue. Like iBastard, I’m not sure whether all the bitter/happy adoptee mess is by design or a natural occurrence. Something tells me it’s a little of both with a touch of opportunism involved. In any case, it’s a distraction that forces those of us who are critical of our adoptions and/or adoption in general into a defensive stance. It’s something we can’t ignore as an attack on our credibility, so while we’re busy defending ourselves, those wishing we would disappear can supposedly go about their business mostly unchallenged. Throw in some divide-and-conquer strategies drawing a line between “good” and “bad”, gather as many “good recruits” as possible on your side and let them help you quash the rebellion. In the meantime, conflict and resentment builds up inside the adoptee community breaking down trust between us. As a result, the division become wider and is reinforced. After countless exchanges that seemed to have made little difference, for me, it’s no longer a productive discussion. Sometimes, it feels too much like having to justify my very existence, and I’m just not going to do that anymore. Ugh, I’ve been suffering from blog-burnout for the last few months. Actually, I thought of stopping altogether. After over a year, I started to feel as if I were talking in circles. Vertigo began to set in. Hopefully, the fog will clear soon. Probably tomorrow since I’ve made this post. I don’t know why but the minute I say I have nothing to blog about, I find something to blog. I guess we’ll see. Random thought – I was so happy to see two more Vietnamese adoptees join the sphere and now I’m outnumbered by boys. It’s not that I’m complaining or anything, but jeese. Random thought #2 – I’m both happy and sad to see my KAD friends getting ready to leave for Korea. I’m going to miss you while you’re away. Random thought #3 – Phrases like “not letting adoption take over your life” is one of the most idiotic things I’ve ever seen. Duh, that’s already happened people. The other stupid one is, “Get over your adoption.” Yes, just jump on over it and hopefully, you’ll forget it ever happened. Move on…denial, denial. Random thought #4 – Whoever made the movie “The Abandoned,” you piss me off. Hate is a strong word, but I really, really, really, don’t like you. There is an article on StarTribune.com about fellow TRA, Bryan Thao Worra and his wife, Ka Vang that is well worth the read. Maverick artists Ka Vang and Bryan Thao Worra, who share family histories of secrecy and shame, use their writing to agitate for change in the Hmong community. In Laos there are two rivers, one serene and clear, the other dark and murky, that define and nourish the land. Hmong writer Ka Vang is the cool Nam Khan River, says her husband Laotian-American writer Bryan Thao Worra. He is the brooding Mekong. Over the past eight years Vang and Worra have become an Asian power couple who have challenged Hmong early marriage, teen pregnancy, domestic violence and polygamy — drawing death threats in the process. In a tribal culture that had no word for art, they are among its literary vanguard, using edgy contemporary poetry, plays and stories to document the Hmong experience and heal its ills. The calls home have become automatic, ritualistic like the prayers I use perform during the days when I thought they’d be answered. The phone rings, there’s an exchange of information about who’s doing what to whom followed by a moment of silence. It’s not an uncomfortable silence anymore, only filled with expectation as I mentally urge him to speak. Can he hear my inner screaming? The thuds as I bang my head and fists on the door? “So when are you moving back home?” he breaks the silence and with it, my resolve. Another instant has been fed to the dogs as I once again go hungry. By now, I can string those moments together like beads and wear them around my neck like a trophy of nothingness. It’s grown heavy over the years, this burden that I carry without knowing why. “God never answers the way we want Him to answer,” my elders use to tell me. Obviously, neither do my parents.